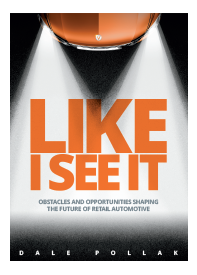 Buy Like I See It Now on Amazon. Robert “Bob” Hollenshead, Founder & President, Buybook Technologies/R. Hollenshead Auto Sales, Inc.
Velocity 2.0: Paint, Pixels, & Profitability Is Here! 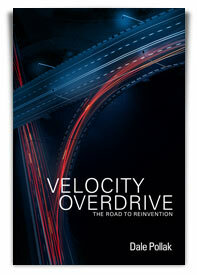 Dale Pollak’s Velocity 2.0 is now available for purchase on Amazon. I enjoyed Dale's first book; have recommended it to so many people as well. Can't wait to read his new book. Dale – enjoyed your first one; have recommended it to so many people as well. be nice if there was an audio version somewhere. There is an audio version (CD) available at Amazon (http://budurl.com/k3ls). It shows that they are out of stock, but I believe they are ordered as needed from the publisher. Hope this helps. Book should be available digitally!! I agree. FYI, the book is presently available on audio in CD format. It seems like I’m always just one step behind the times in the publishing world. Sorry for my delay in responding to you – I was not notified of your question. My books are not available in bookstores, only on-line at Amazon. Thanks so much and let me know your thoughts. Hi Dale, I am looking to purchase all 3 of your books in CD format so that I can listen to them while I drive my several hours per day commute. Are they available on CD from anywhere? I’ve looked into this as I wasn’t sure what book was available in which format. Velocity 2.0 is the only one of the three available in CD format. Velocity Overdrive is available through Audible if you have a reading device or player that you can connect to your car. Both are available through Amazon.com.